This year, more than other years, I am looking forward to spring. Up here in Maine we have had a very ‘wintery’ winter with snow levels in the several feet range. Needless to say I have been spending most of my time indoors and with being pregnant I am pretty much house-bound. This type of environment doesn’t lend well to someone who has had anxiety issues for several years now. Also while pregnant, I am not taking any ‘traditional pharmaceuticals’ to control the anxiety so I needed to find a combination of ‘natural’ remedies that would get me through this time. Being pregnant has actually given me the time to really look to other ways of trying to relax and reduce my anxiety. I have been using a combination of weekly therapy and also have gotten more involved in focusing on my spirituality which has helped immensely. 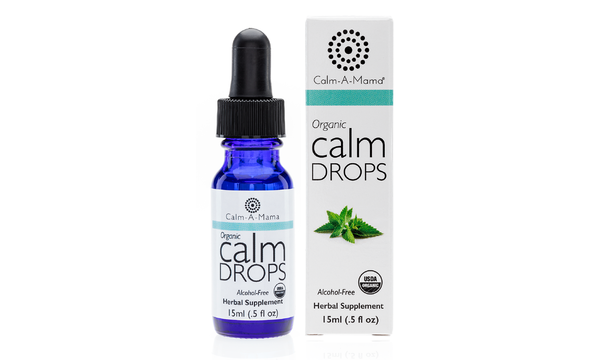 I did discover that I did need something else and that is when I was introduced to Calm-A-Mama Organic Calm Drops. This alcohol-free herbal supplement has been a life-saver during my pregnancy. The herbal supplement is a lemon balm and flower extract blend. I’ve been taking the drops regularly at least two times a day and more if I am experiencing a stressful situation. In the morning I put 4 drops in a glass of water and start my day out that way. We all know that we are ‘supposed’ to drink at least 8- 8 ounce glasses of water a day so I figure I am helping my anxiety and keeping hydrated at the same time. Usually mid day I’ll put 3-4 drops under my tongue. The taste is surprisingly pleasant. Many supplements/blends are very ‘medicine-taste-like’ and very bitter tasting. To me the supplement tastes like a lemon-licorice lozenge taste (there is no licorice in the blend but to me it tastes a bit like it). I’ve also started giving a dose to one of my kids who sometimes has a hard time in the early evening being so over-tired from the school day. It has greatly helped him to wind down and has made bed-time so much calmer for him and for myself. Perhaps having this supplement well stocked in the home, in the car, and in the diaper bag would make all of our days just a little bit calmer! The above post is written from a personal perspective using the above product and does not take precedence over the advice from a physician. We advise you to consult with your physician before taking any supplement. This entry was posted in Blog and tagged calm-a-mama, food and drug administration, generalized anxiety disorder, herbal supplements, natural remedies. Bookmark the permalink.